This is me at the start VS at the end of my 100 days journey. 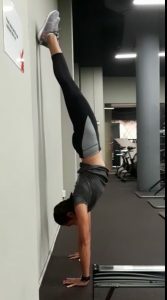 I failed to do a handstand at the end of my journey but I’ll give myself a bit of credit considering I didn’t had any proper teaching throughout my 100 days, only depending on YouTube which sometimes poses as a danger when there are just too many info out there. I also began my journey absolutely fearful of being upside down and with a shoulder which has dislocated twice. I started off doing planks on my hands, and then progressed to putting my feet on a chair and then on a wall, and slowly making my feet up the wall, and hands closer to the wall. I did some hollows too and leg lifts and some crunches just to work on my core. 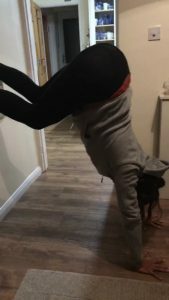 I watched a hundred YouTube videos, each having different ways to do a handstand. Halfway in the journey, I realised I haven’t been making much improvements. I was hardly able to hold myself on my hands and I had this immense fear of kicking up and being upside down. I didn’t practice for a few days. Then on Day 80 something, while I was at triple fit after a morning run, I met Coach Firdaus and his wife. Firdaus is well known in the handstand community for his masters in this art. Him and his wife gave me some tips on how to kick up on the wall and for the first time, my foot was able to reach the wall, but I couldn’t stay up. But that day changed everything- suddenly I had hope again. Since that day, I practiced kicking up every single day. Then one day, I was able to place both feet on the wall and stayed there. The next day, I was able to kick up with my legs straight. By Day 100, I can confidently kick up on the wall and stay there for as long as my head and arms allow me to. It isn’t exactly a proper handstand but it finally gave me the confidence to sign up for the handstand class that Coach Firdaus holds every month. Overcoming fears doesn’t have to be big things. It’s doing the little things everyday that scares you, that makes you gain a little more confidence each time, that makes you braver, stronger. My goal wasn’t a big deal. It’s just a handstand anyway. Some people can walk on their hands, some backflips and front flips and do all sort of things. My goal was just a handstand but it meant a lot to me because since Rio, I have been disappointing myself with not being able to set goals as big as the Olympics. I know that pretty ridiculous, creating unnecessary stress about stupid things like not having goals big enough like the Olympics. But goals don’t have to be the size of an Olympics. I started my rowing journey not even being able to see the sight of a SEA Games medal, what more being an Olympian. So what am I thinking being all sad and sappy about not having a goal as big as the Olympics? Anyway, that’s for another story. 100 days is too long and on some days, I lose focus and motivation. Sometimes keeping the deadline short can be more efficient. I sourced out for way too many help- the hundreds of YouTube videos, asking many people for help. They were useful in their own ways and of course it must have worked for them thats why these people are teaching them on YouTube but for me, there is no consistency. One day I’m doing this and next day I’m attempting a different method. There is no progression. I should have just picked one method and worked on it. Or rather, I should have signed up for Firdaus’s class much earlier. Once you’ve overcome a fear, you wonder what held you back in the first place.